Tiger Woods reacts after winning the Masters Tournament on Sunday. It was his first win in a major tournament since the 2008 U.S. Open and his first win in the Masters since he won that tournament 14 years ago. 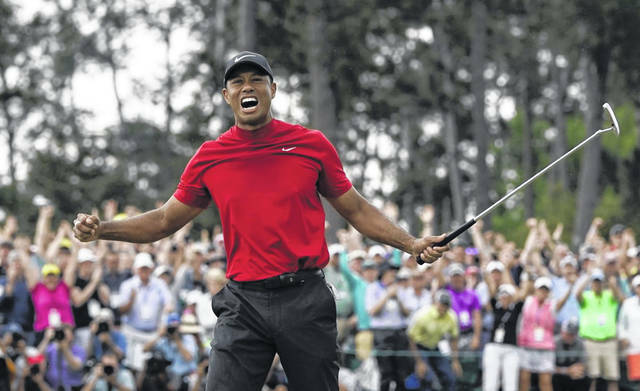 https://www.limaohio.com/wp-content/uploads/sites/54/2019/04/web1_1Tiger.jpgTiger Woods reacts after winning the Masters Tournament on Sunday. It was his first win in a major tournament since the 2008 U.S. Open and his first win in the Masters since he won that tournament 14 years ago.